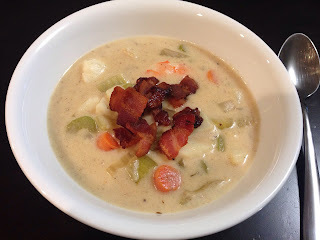 If you want to make a corn chowder, do the same thing but replace the seafood with 1 can each of cream of corn and corn niblets. Add a splash of water to a large dutch oven and brown bacon until crispy over medium high heat. Set bacon aside but keep all the bacon grease in the dutch oven. Add onion, carrots, celery, garlic, dried thyme, cayenne pepper, and a pinch each of salt and pepper. Mix well until garlic is fragrant. Stir in flour and mix until you can't see any more white/raw flour. Slowly add in water while stirring the veggie/flour mixture. It'll be kind of clumpy but adding in water slowly will help unclump everything. Add in potatoes and evaporated milk. Bring to a simmer and simmer on low for 15 minutes, covered. It'll form a skin but no worries; just stir to get rid of it. Turn heat up to medium low and stir in seafood. Keep stirring occasionally until seafood is cooked through; about another 10 minutes. Season with more salt and pepper if needed. Serve with bacon "bits" on top as garnish and French bread/baguette to sop of the chowder.